In the finest stretch in Aditya Kripalani’s Tikli and Laxmi Bomb, we see a stifled Laxmi (Vibhawari Deshpande) run away from the hospital room where her roommate Tikli (Chitrangada Chakraborty) lay unconscious. Next, we spot her by Mumbai’s Marine Drive, making a customary metaphorization of Mumbai versus her ilk. “Mumbai, aren’t you just like us? Looted by all,” She sings a ballad, “Mumba Devi de mujhko maafi…” The gut-wrenching song continues (in a male voice) as she leaves for home seated in a taxi. A charming Indie on the hazardous existence of Mumbai’s streetwalkers, Tikli and Laxmi Bomb is about such tiny moments spread throughout its tiringly long run-time. Yes, the length forms a major spoilsport in a film that is extremely well-meaning and even better made. Let’s delve into that later. The film takes off with the arrival of Putul into the life of Laxmi. Called the ‘Bengali Bombshell’, Putul isn’t very amused by the ways of the ‘industry’ that local prostitution is. “It’s a man’s world,” asserts Laxmi, time and again, but Putul isn’t quite convinced. The duo, eventually, designs a plan to revolutionize the ways of working for local streetwalkers, which forms the premise of Tikli and Laxmi Bomb. For starters, the film is quite a slap in the face of misogyny. 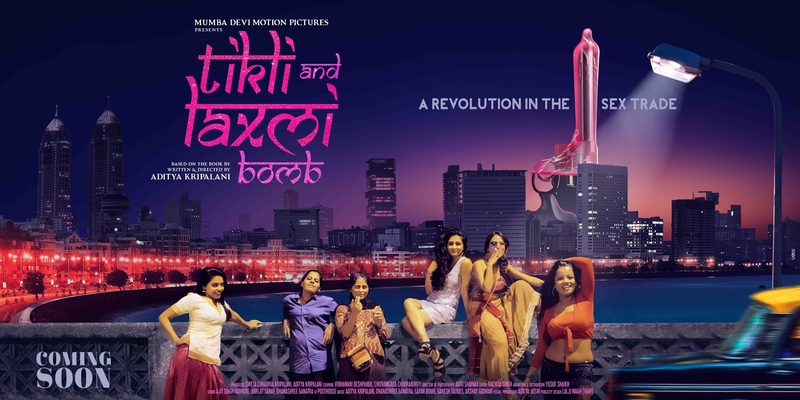 Based on the director’s own book of the same name, Tikli and Laxmi Bomb discusses a commercial framework that is entirely spun around women and their bodies but is fully ‘run’ by men. Be it the lecherous corporator or the Ranveer Singh-loving autorickshaw driver, the male characters in the film scream of power and male privilege. Well aware of the hazards of being a woman in general, a tough Laxmi often reminds Putul that the revolution is entirely the latter’s. Putul, while fighting for her own clan, declares how she wants to live like a king, not a queen. The difference is crystal clear for her – even as her fight is for a singularly feminist cause. However, on the flip side, Tikli and Laxmi Bomb is one that alarmingly tests your patience. For a film with a subject as grim as this, a two-and-half-hour runtime is hardly feasible. For the fact, the film with its pretty straight-forward storytelling doesn’t fully keep us lured to its proceedings. Kripalani’s writing is such that the episodes take its own sweet time to develop. The impact gets further crippled on the editing table. The pacing is inconsistent and the shot transitions are way too noticeable, making the editor’s job appear amateur. I am also not a big fan of the way in which the story ends. Not that it doesn’t make sense but the pre-climactic twist feels so sudden and unwarranted for all the build-up. It doesn’t do justice to the narrative arc that the Kripalani had outlined until then. An emotional justification about Tikli’s impulsive and insanely loving ways surfaces in the last reel. While I wanted to love and buy each of these plot points, they did not seem genuine enough to be affected. Next Post“Hey Jude” … An endearing dramedy that incites a great deal of empathy!